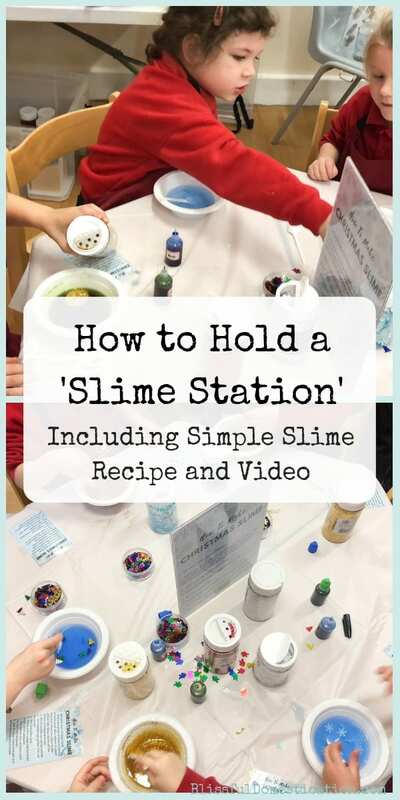 Slime has never been so popular, and when I was given the task to host a Slime Station at our school’s fair, I set about finding the perfect Winter Slime Recipe for the job. Kid’s love slime, and my children are no exception. They love the tactile nature of it, and it can provide hours of entertainment. 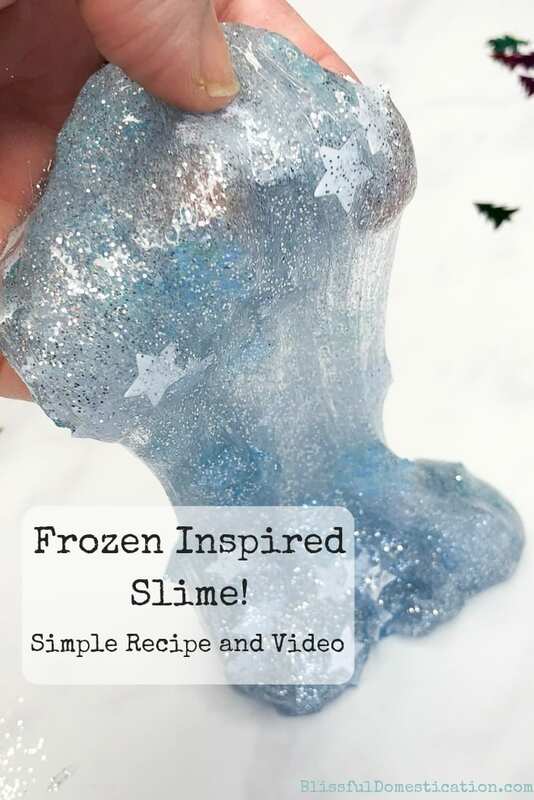 We have made very basic slime before, but for this project I was looking for a simple Winter Slime recipe that could be replicated on a large scale. I also wanted to allow the children at the fair to personalise their slime and watch the magic as it turns from a bowl of liquid to the squidgy slime we all know and love. If you’re a big slime fan like we are, then I would suggest you visit Little Bins for Little Hands website, which has loads of inspiration and ideas and tons of variation on slime recipes and related projects. 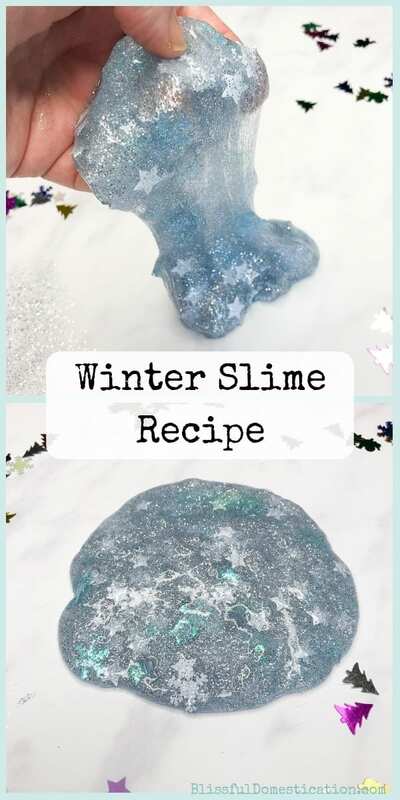 I found their site a great help, and used their basic saline slime recipe to form the basis of this Winter Slime Recipe. However, I had to adapt it a little to what was available here in the UK, and tweak the quantities. Who knew that UK cup measurements were slightlyy different to the US ones? After several attempts I came up with this recipe. It was easily replicable, and a small enough quantity to be stored in a plastic condiment pot so the children at the fair could take their DIY slime home with them. 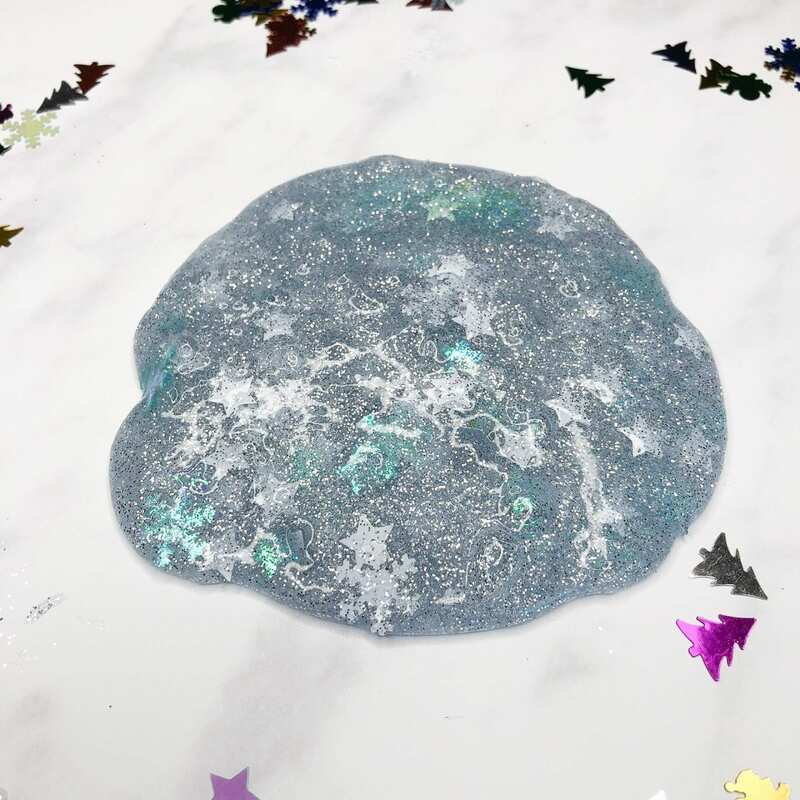 So if you would like to see how I made our Winter Slime, and my top tips for hosting a Slime Station read on, or pin it for later! Pin Winter Slime Recipe For Later! 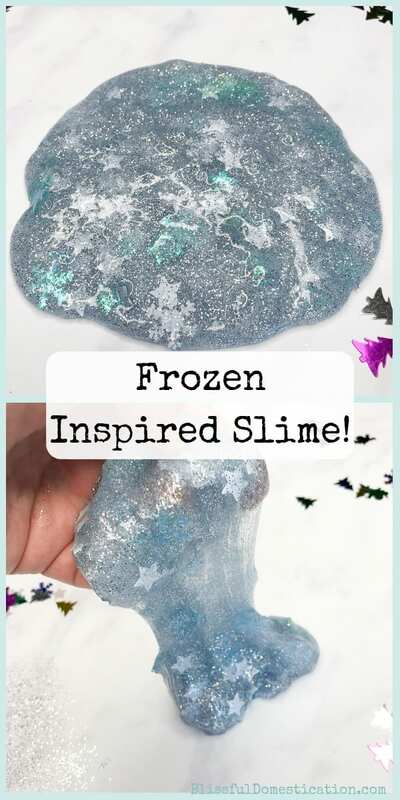 It doesn’t have to be winter to be honest, the beauty of this recipe is that it can be adapted by using different colourings, glitter and sequins to make whatever slime you want! Perfect for the school fair and a slime station. I was lucky enough to have been gifted a whole host of winter and Christmas themed glitter and sequins by the lovley people at SS Arts and Crafts. Not just to develop the recipe, but also enough for all the children at the Christmas Fair to use. 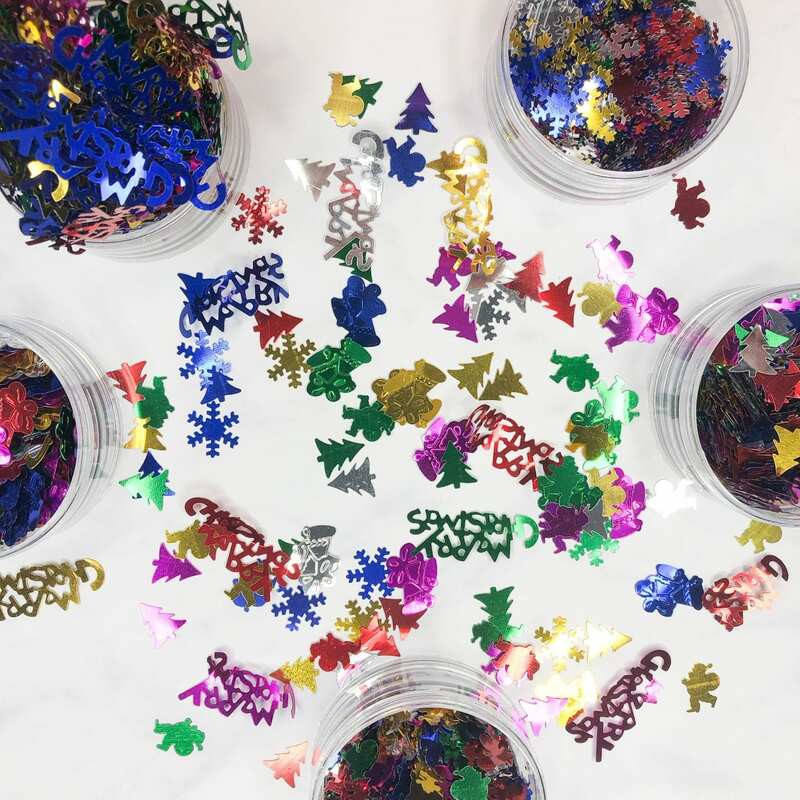 We had Glitter Shakers in gold, silver and red, and these fab Stars and Snowflake sequins, and an array of Christmas sequins too. As I really wanted the glitter and sequins to show through, I used a clear PVA glue. The recipe would work just as well with white PVA, but the glitter and smaller sequins get a bit ‘lost’ in it. 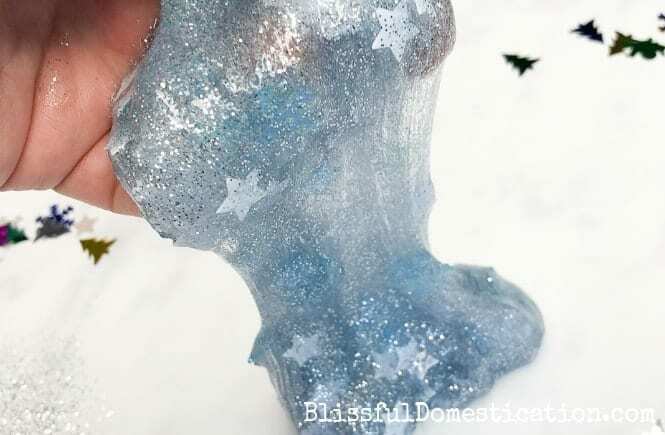 To master the Winter Slime Recipe I choose blue food colouring, stars and snowflake confetti and silver glitter which almost made it a Frozen esque slime. First add the glue and water to a bowl, stir to combine. Add the bicarbonate of soda and stir well until completely dissolved (be careful it doesn’t clump). Add a few drops of the food colouring, and stir again. Add glitter and sequins of your choice. Give it a good stir to evenly distribute them. Now for the fun part! Add the lens soloution and stir vigoursly. You will see the slime coming away from the edges of the bowl. Keep stirring until you can’t stir anymore. Take the slime out of the bowl and kneed it a little to reduce the stickiness. That’s It! Very simple, and great for the kids to get involved in. I have made a little video for you to explain the process better. Once you’ve mastered the basic recipe, you can experiment with different colourings, glitters and sequins. However, sometimes the food colouring doesn’t come out how you expect it! I had it in my head that it would be great if the kids could make green, red and blue slime. Although blue food colouring makes blue slime (as you would expect) that’s not always the case. I found red turned black, green turned yellowy-green and mixing blue and green made green slime. A reaction I think with the Bicarbonate of Soda, so if you have a specific colour in mind test it first! As I said earlier the whole purpose of developing this Winter slime recipe was to host a fundraising ‘Slime Station’ at the kids school fair. 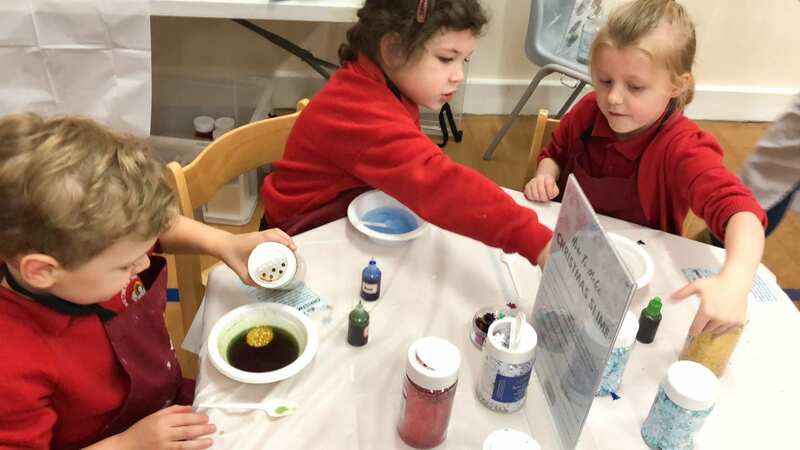 It needed to be a recipe that was easily replicable, but also allow the kids to make their own design of slime and give them some freedom to express themselves. The whole fair was just 2 hours start to finish and with potentially 80+ children to cater for, everything needed to be well organised and run like clockwork. Fortunately the Slime Station was a huge success, lots of happy children, and raised lots of money for the school. Practice your recipe at home using the individual quantities that the children will use. Not only does it help to make sure your recipe is fail safe, but also that you have the right size containers. It also means little surprises like food colouring changing colour won’t catch you out on the day. Source your materials in bulk and find the cheapest suppliers. This maximises profit if you are doing it for fundraising. 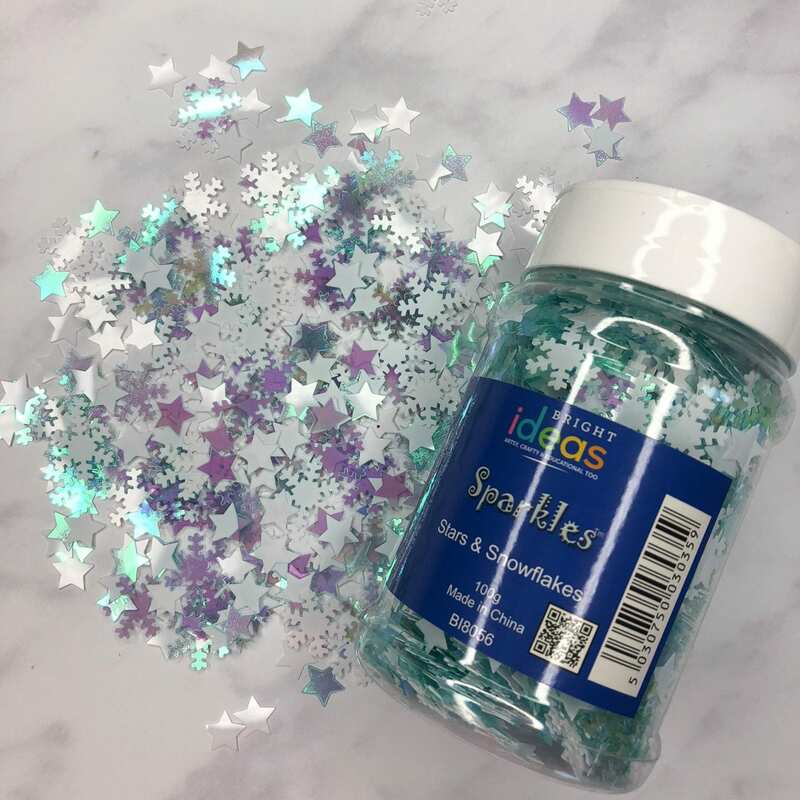 Check out S&S Arts and Crafts for their great range of glitter and sequins. Use disposable bowls and spoons, and buy condiment containers so that the kids can take their slime home with them. Rope in some help for the Fair! It can get quite busy, and I honestly couldn’t have done it without the help of my Mum and a Friend! Have a seperate table with premixed bowls of glue, water and bicarbonate soda, away from the main table. This means all the measuring is already done, and helps prevent spillages. Set up the kids table with wipeable table cloth and aprons. 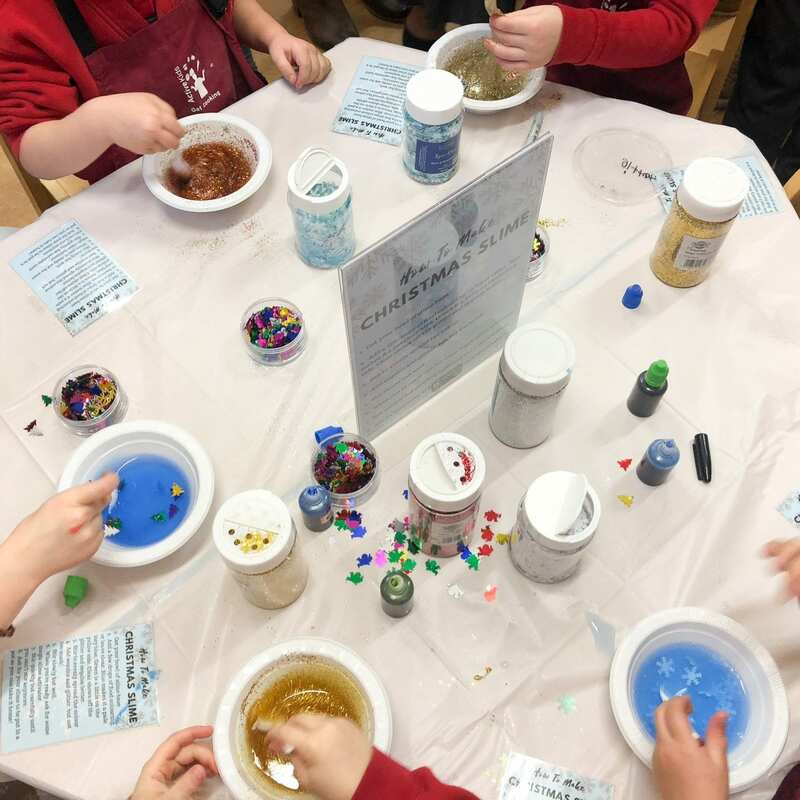 We had instructions for the children on the table, along with spill proof bottles of food colouring and loads of the glitter and sequin shakers kindly provided by S&S Arts and Crafts. When the kids were ready, an adult added the contact lens solution. This was to avoid spillages and waste, but the children still got to see the ‘magic’ happen as they stirred! It was great to see all the different types of slime the kids came up with, lots of winter slimes and frozen inspired ones, but we also had some green and even some that looked like galaxies far far away! All in all the kids had a great time, and it was a huge success. Roll on next year! Are your kids slime made like mine? Have you tried to make slime at home before? I’d love to hear what you think in the comments. I would like to thank Little Bins for Little Hands for their technical advice and support, and S&S Arts and Crafts for supplying all the glitter, sequins and slime embellishments. The kids and grown ups had so much fun making the slime. The sequins looked great. I. Just get round to doing this, I bought all the ingredients ages ago but still haven’t done it! Definitely pinning this one for later – my daughter is only 5 months old but this is something I would love to make with her in the future. The slime looks amazing!